CityViews: Is New York’s Mental-Health System Listening to the Peers Who’ve Lived It? "Part of the beauty of IDHA is that it rests at the confluence of multiple movements and generations and there are some super talented and passionate people involved in the mix. Projects like IDHA represent a new wave of resistance that is less about human rights and individual choice and more about the insistence on full-fledged participation in our own healing, and more importantly, in healing by and through community. 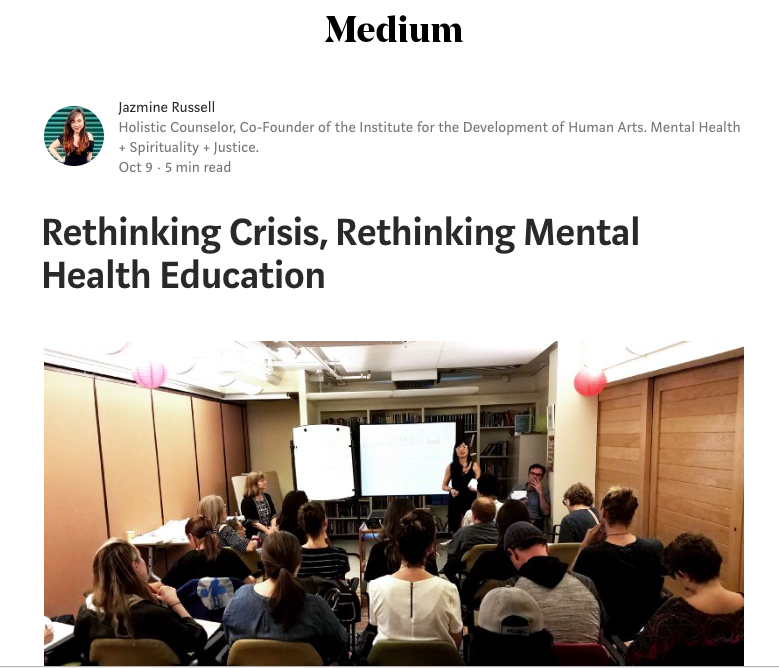 There’s also something about the collaboration between people working on the ground and people in the academy, collaboration between Peer Specialists and conscious clinicians, collaboration between artist movements and mental health activists." "The [Institute for the Development of Human Arts], a collaborative think tank, has come together to refocus on the values at the heart of human healing. Their first eight-week course, “Rethinking Crisis,” creates a framework for exploring and understanding the challenges in our current mainstream systems while laying the groundwork to co-create a new paradigm that can better reflect the ethical codes that guide our professions. Being in classes with diverse professionals and experiencers with backgrounds that clearly demonstrate how many of our systems have unintentionally created harm in the interest of healing has given me the opportunity to learn and further sensitize myself to the ways I engage with the people I work with."